One more reason to use branded food gifts: The health benefits of chocolate nuts and cheese! Now here’s a story we can all appreciate. This story comes our way via one of our favorite suppliers of logo-branded food gifts – which are popular all year around. So we thought we’d share. Did you know that besides being delicious, many of the (food) products (from our favorite supplier) can be good for you? When you hear the word “healthy”, you probably think of fruits, vegetables or maybe lean meats, but they are not the only options. Lets take a look at the health benefits of three types of items that we carry. 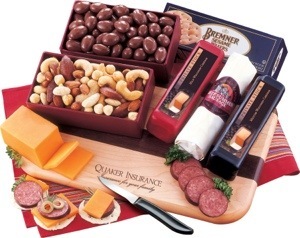 The Party Starter package (shown above) contains chocolate, nuts and cheese (and a beautiful cutting board branded with your logo). All 3 have wonderful health benefits. but its health benefits have received a lot of attention lately. Flavanols are a naturally-occurring antioxidant found in cocoa. Flavanols have been linked to improved cardiovascular health and lower risks of heart failure, cancer and diabetes. Another study suggests that the flavanols found in cocoa may help treat strokes or dementia because they promote blood flow to the brain. Like many foods, moderation is key to reaping the benefits without the ill effects of overindulgence. Nuts have been a regular part of the human diet since pre-agricultural times. They are a healthy snack that can be stored easily and carried with you. Nuts are considered very good for your heart. The unsaturated fats can help lower the LDL (low-density lipoprotein or “bad”) cholesterol level in your blood. Most nuts are rich in omega-3 fatty acids and nuts contain fiber which also helps lower your cholesterol. Heart health is not the only reason to eat nuts. In addition to helping lower cholesterol, fiber may help with reducing the risk of developing diabetes. Nuts are an excellent source of Vitamin E which is a powerful antioxidant. Vitamin E has also been found to help stop the development of arterial plaque which narrows your arteries narrows and can lead to chest pain, coronary artery disease and even heart attacks. In Wisconsin, they certainly do not have a shortage of cheese. If you are not a fan of going to the dentist, you will be happy to hear that cheese is great for your teeth. It is rich in calcium which is very important for healthy teeth. Cheese helps stimulate saliva which helps keeps your mouth clean. The same calcium that is good for your teeth is also good for strong and healthy bones. Cheese contains Conjugated Linoleic Acid (CLA) which is known to help prevent cancer. The B vitamins in cheese are healthy for many of your body functions and are also good for your skin. As is the case with chocolate, moderation, when consuming cheese, is important.